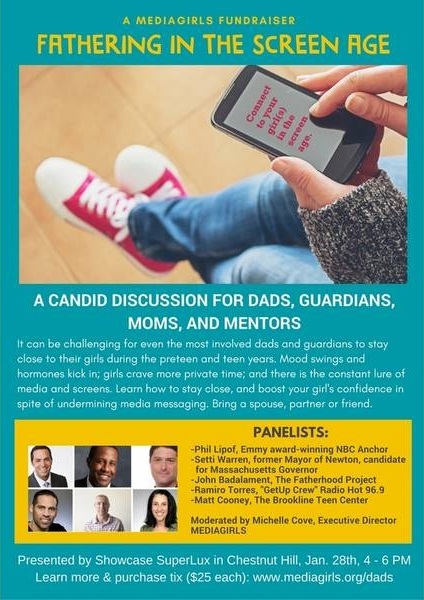 From Media Girls: MEDIAGIRLS announced that it is hosting a panel discussion aimed to bring together fathers and male guardians to talk about how to stay connected with their daughters in the screen age. Half of all teens say they are addicted to their technology devices, and depression among teen girls is reportedly on the rise. The event, presented by Showcase SuperLux in Chestnut Hill, MA, will take place on Sunday, January 28, 4:00 to 6:00 pm. The panel includes Phil Lipof, local NBC Emmy-winning anchor; Setti Warren, former two-time Mayor of Newton and gubernatorial candidate; Ramiro Torres, morning personality on radio HOT 96.9; Jon Badalament, Head of Programming for The Fatherhood Project; and Matt Cooney; Executive Director of The Brookline Teen Center. MEDIAGIRLS Executive Director Michelle Cove will moderate. The event is open to the public. Attendees can arrive at 3:30 p.m. for the opportunity to enter a raffle for father-daughter experiences donated by local shops and restaurants at The Street. MEDIAGIRLS will share film and TV clips of dads and teen girls, and the panel will talk candidly about their own experiences in raising girls. Specific tools will be provided to help attendees build stronger relationships with the teen girls in their lives. Tickets are on sale here, and all proceeds go directly to bringing MEDIAGIRLS programming to girls at low-income schools in Boston.